These earrings are set in top quality, Yellow Gold over Sterling Silver & Platinum over Sterling Silver Settings. Total ct. weight of earrings is 1.60ct consisting of. Feature of Stones: 100% Natural Sapphire. Earrings closure: Stud ( see the pictures). Shape of stones: Round 4mm, 6 pieces. Weight of Stones: 1.50 Carat. Total weight: 1.98 grams. This is a pair of Yellow Beryl Earrings. These earrings are set in top quality, 14K Yellow Gold. Total ct. weight of earrings is 1.57ct of Golden Yellow Beryl. These beryl are 100%natural ,earth mined stones. 14k Solid Gold Flower Stud Earrings with Natural Mix Stones. Earrings Closure: Stud. We are soul goes into everything we do. Everyone now can afford the beautiful jewelry that you alway dream of. Shape of Stones: Round. Authentic Ethiopian Welo opal dangle earrings featuring a favorite traditional Celtic knot design in solid. 925 sterling silver. The natural opals show great play of color. Pair these earrings with one of our silver Celtic knot opal pendants: perfect! These are natural Lightning Ridge opal earrings. Origin Lightning Ridge. They have been prong set to 925 sterling silver trims. The opals are transparent displaying blue colours. Actual item is shown in photos. This is a pair of Golden Yellow Beryl Earrings. These earrings are set in top quality, 6 prong, 10K Rose Gold. Total ct. weight of earrings is 1.50ct of natural, Golden Yellow Beryl. VVS1 Clarity ! This is a pair of Chrysoberyl Earrings. These earrings are set in 4 prongs, 14K Yellow Gold. These Chrysoberyl are 100% natural ,earth mined stones. Clarity grade: VS. Total ct. weight of earrings is 1.52ct of natural, Chyrsoberyl. 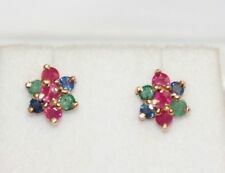 These earrings are made from solid 14k yellow gold and feature both diamond and opal gemstones. The opals total approx. 1.56cts and are round and pear cabochon cut. The diamonds are round cut and have I1 clarity and I color. This is a pair of Ethiopian Welo Opal Earrings. These earrings are set in top quality Sterling Silver 925. Oval Button Design. Bezel Bead Diamonique set off by rope and bead motifs. Security Marked invisible ink. Natural White Diamonds.10cts. Color: G Clarity: VS1. Gram Weight: 0.94 Grams. Australian opal earrings, solid 14 k gold. Solid 14k Yellow Gold Earrings inlaid with Natural Australian Opals. OPAL SIZE : 8 x 6 x 2.2 mm. OPAL WEIGHT: Approx 1.50 carats Combined. Opal has Color but is Fairly Dull. We really like how the ice white tone of the round cut cubic zirconia perfectly flaunts the vibrant red hue of the round cut ruby centre stone set within these traditional cluster earrings. 9ct Yellow Gold Real Ruby Cluster Stud Earrings - British Made - Hallmarked. Not to be confused with cubic zirconia, Zircon is a natural gemstone with a brilliance that rivals Diamond. .44cts, the sapphires total appros.44cts, rubies approx. The diamonds total approx.40cts and have SI1-2 clarity and G color. Gemstone Type: Genuine. SI1-2 clarity and G color. Diamond Clarity Chart. Stone: Genuine Malachite. Matching necklace and pendant available. Most problems are easily and quickly solved. While we do every thing we can to minimize problems. This is a SINGLE Ethiopian Opal Stud Earring. This earring is set in top quality ,925 Sterling Silver. Total ct. weight of single earring is 1.70ct of multi colored sparkling, Ethiopian Opal. Opal is natural, not enhanced. 9K Gold Claw Set Real Garnet Pear Solitaire Earrings - British Made - Hallmarked. An attractive pair of yellow gold earrings in January's birthstone, this lustrous piece has been expertly crafted to hold a pear faceted garnet stone in a traditional claw setting, making this an ideal gift for yourself or a loved one. Gem Type Natural Tanzanite AAA . Natural ﻿ Natural Tanzanite. Tanzanite Information. Stone shape﻿ Oval. Minimum total gem weight﻿ 1.60 carats. Minimum clarity﻿ VS. Minimum color﻿ Blue/Violet. This is a pair of Clinohumite Earrings. These earrings are set in top quality, 6 prong, Sterling Silver . Total ct. weight of earrings is 1.66ct of Fanta Orange Clinohumite. These clinohumite are 100%natural ,earth mined stones. Item: r415u. You will receive the exact earrings pictured. Most problems are easily and quickly solved. While we do every thing we can to minimize problems. NEW DIVINE PRECIOUS 925 STERLING SILVER CUSHION SHAPED TWO-TONE CITRINE per SIDE GENUINE CITRINE EARRINGS 1.72 ctw. Divine Precious presents this pair of cushion shaped natural genuine citrine earrings. This is a pair of Grossular Garnet Earrings. These earrings are set in top quality, 4 prong, Sterling Silver . These garnet are 100%natural ,earth mined stones. SET IN A 10K WHITE GOLD MOUNTING WITH. 033CT OF WHITE DIAMONDS. Garnet 925 Sterling Silver Dangle Earrings. Stone: Genuine Garnet. Genuine 925 Sterling Silver. Most problems are easily and quickly solved. Opal Gemstone 14k Yellow Gold Halo Stud Mini Earrings Special Gift For Valentine Jewelry 6x4 mm. Earrings - Diamond Earrings, Gemstone Earrings, Dangle Earrings, Hoop Earrings, Color Stone Earrings, Ear Wrap Earrings, Stud Earrings etc. Primary Stone: PERIDOT. Fine handcrafted jewelry personally designed from the inspiration from those little things around us. Style: Earrings. We too take and feel the delight to fabricate enticing Victorian style, traditional designs. Stone: Genuine Mother of Pearl. While we do every thing we can to minimize problems. Stone: Genuine Moonstone. While we do every thing we can to minimize problems. Moldavite is the only known gem that fell from the heavens. It is classed scientifically as a tektite. Moldavite has been prized by humans for over 25,000 years. Simple and elegant. these comfortable silver stud earrings each hold a precious Moldavite in a beautiful shade of green that is unparalleled. Beautiful genuine pair of 925 Sterling Silver Hoop Earrings with Natural Garnet Charms. Each Garnet is set in Sterling Silver is eye clean in clarity and weighs. 75cts, 1.5ctw. The featured earrings are cast in 14k white gold and showcase round cut white topaz gemstones & round cut diamond accents set on halo settings. 1.67 ct White Topaz Gem & Diamond Leverback Baby Earrings in 14k White Gold. SOLID 14KT YELLOW GOLD EARRINGS. NATURAL AQUAMARINE IS 1.70 TCW. AQUAMARINE IS 7x5 mm OVAL SHAPE EACH. NATURAL DIAMOND IS 0.01 TCW. WITH GIFT BOX.